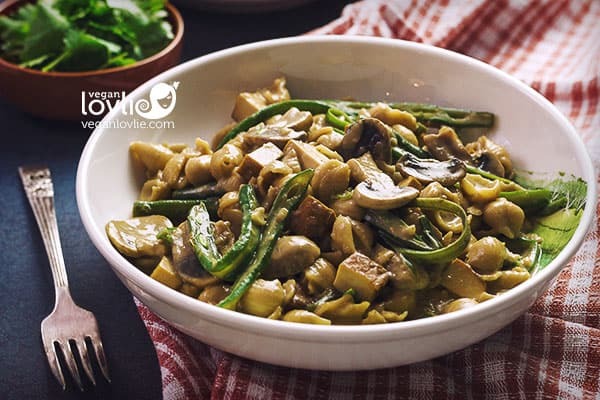 When chilly autumn nights beckon a nourishing bowl of comfort food to warm the heart, this Smoked Tofu Mushroom Stroganoff with Green Beans might just fit the bill and become your next family-favourite home-cooked meal. It’s an ideal weeknight meal and an easy one-pot dish in the pressure cooker (or stove top) that can be made in about 30 minutes from start to finish. 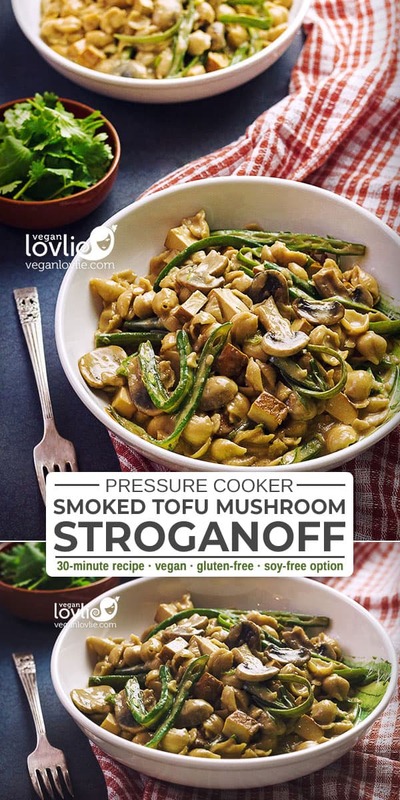 This vegan stroganoff recipe is gluten-free, can be made soy-free and low carb (vegan keto-friendly options). 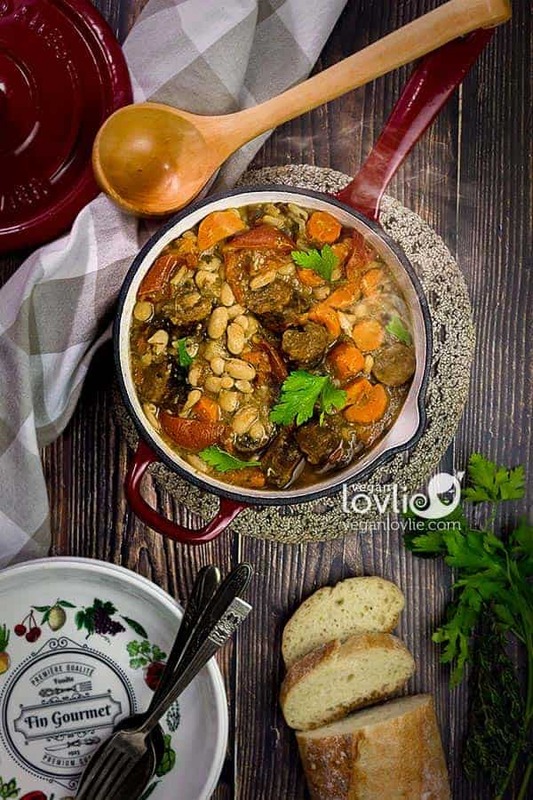 Traditionally a Russian meat dish with sour cream as the base sauce, there are however variations of the dish around the world. We are giving it a plant-based twist with flavourful smoked tofu, meaty sauteed mushrooms and a handful of fresh green beans for some crisp vibrancy. The result is a hearty velvety pasta dish while keeping the calorie count much lower than the traditional dish. 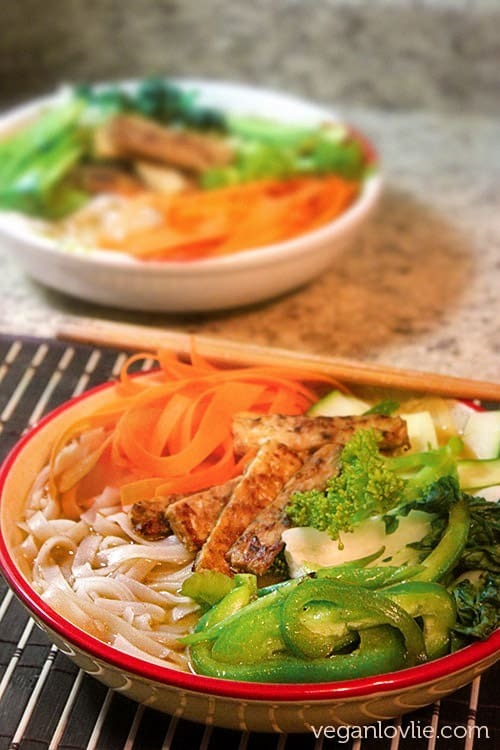 For a low carb version or vegan keto-friendly option, use bean pasta or shirataki noodles. For soy-free option, substitute the smoked tofu with chickpeas and the soy sauce with our soy-free gluten-free soy sauce substitute. The green beans in this dish not only add a pop of colour and an awesome crunchy texture but they also make this meal nutrient dense. 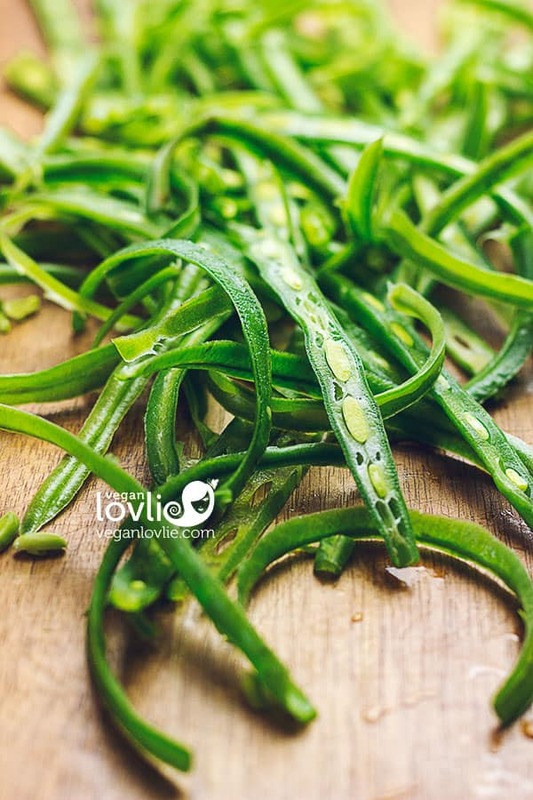 When sliced length-wise, the green beans release their beautiful aroma and flavourful juices adding so much depth to the sauce. The texture is also a whole lot different and really worth the little extra time it takes to slice them in this fashion. 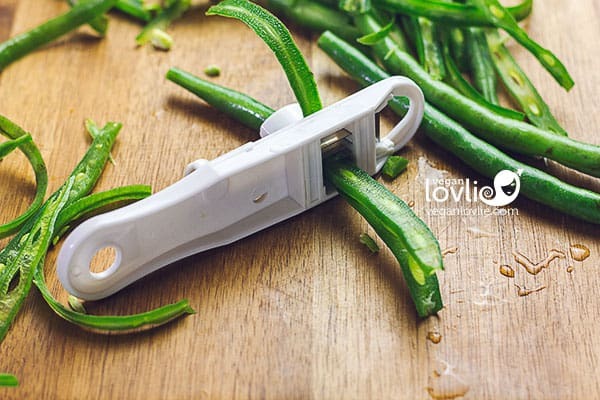 You may manually slice them in half along the length but I love my trusty French bean slicer which actually does a swift neat job. I purchased mine on Amazon Canada, you can also find an equivalent one on Amazon US. You do need very fresh and crisp beans for this though otherwise, it can be a little fiddly to get the beans to pass through the blades if they are limp. 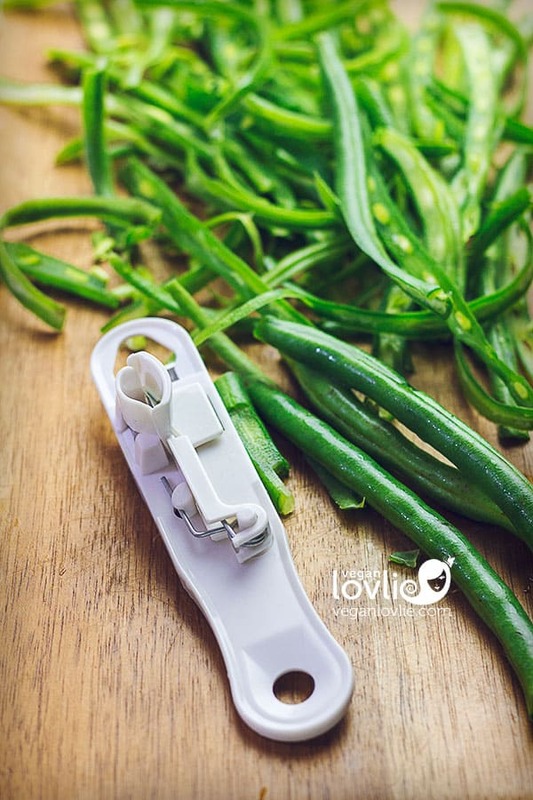 You can see our French bean slicer in action in our Instagram stories if you follow us there. 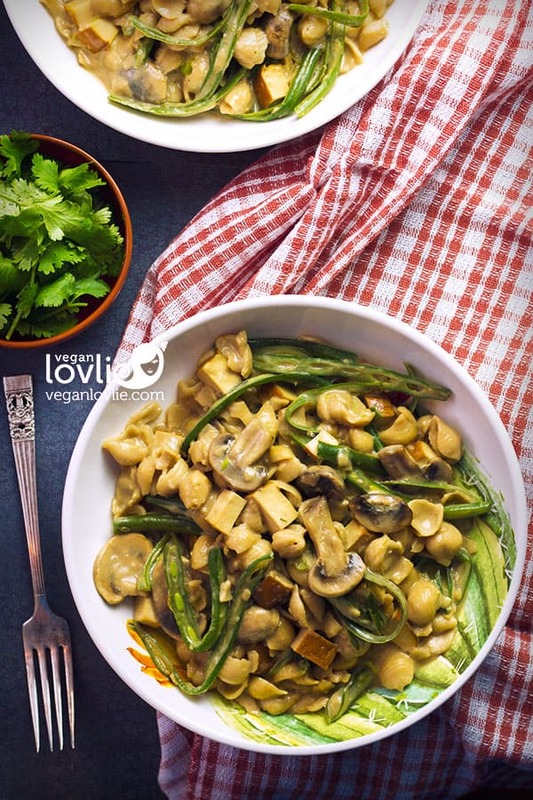 If you make this Smoked Tofu Mushroom Stroganoff with Green Beans, we’d love to hear what you think. Please leave us a comment below. It would really make our day! You can also follow us on Instagram and make us drool over your creation. 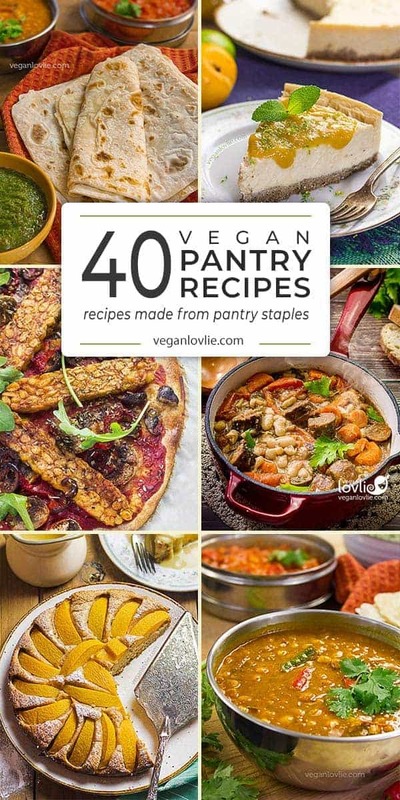 Just tag us @veganlovlie and hashtag #veganlovlie so we don’t miss it. 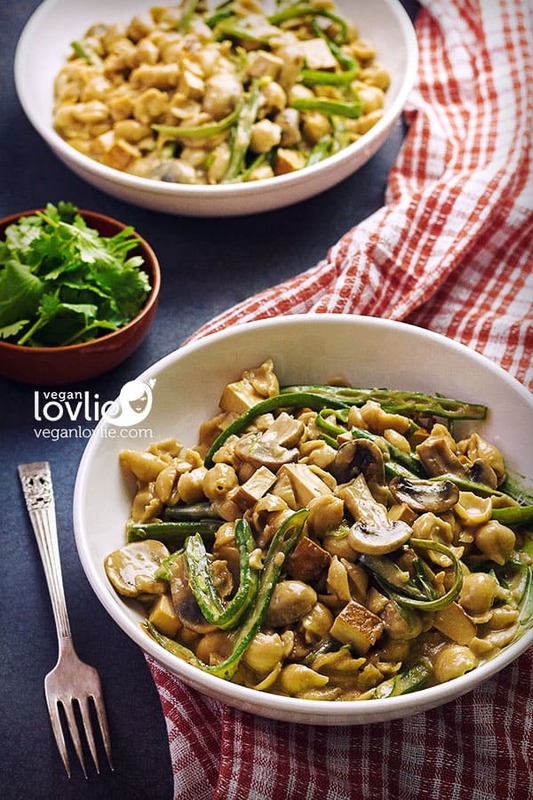 A flavourful one-pot vegan stroganoff dish with smoked tofu, sauteed mushrooms and green beans for some crisp vibrancy. Just what you need to warm the heart on chilly autumn nights. Set the pressure cooker on saute mode. Heat the coconut oil then add the minced ginger, garlic and onion and saute until the onion is translucent, about 3 - 4 minutes. Add the green beans, mushrooms and smoked tofu and saute for about 3 minutes. Pour in 600 ml water or vegetable broth and soy sauce or tamari. Add the thyme and paprika. Drop in the pasta and stir to combine. Cancel the saute mode. Close the pressure cooker with the valve in the closed position. Set the cooker on manual, medium pressure for 3 minutes, (****see recipe notes for variation). Once the time is up, allow the pressure to naturally go down for 10 minutes. After 10 minutes, open the valve and release the remaining pressure, then remove the lid. Mix the potato starch with the coconut milk and 60 ml water. Add more water if you want more sauce. Set the cooker on the saute mode. Pour in the coconut milk mixture. Stir and continue to simmer until the sauce thickens, another 2 - 3 minutes. Cancel the saute mode. Taste and season with salt if needed and black pepper to taste. Ladle the creamy pasta in bowls and garnish with freshly chopped parsley. Serve immediately. Heat the coconut oil in a pan on medium-high heat. Add minced ginger, garlic and onion and saute until the onion is translucent, about 3 - 4 minutes. Add the green beans, mushrooms and smoked tofu and saute for about 3 minutes. Pour in the water or vegetable broth and soy sauce or tamari. Add the thyme and paprika. Reduce heat to medium and simmer until the liquid has reduced by a third, about 7 minutes. Mix the potato starch with the coconut milk. Pour in the coconut milk mixture. Stir and continue to simmer until the sauce thickens, another 3 minutes. Remove from heat. Proceed as for the saucepan instructions until step 4. Close the pressure cooker with the weight whistle fitted on. Cook on medium heat and count 3 minutes as from the first whistle. Turn off the heat and let the pressure go down naturally for 10 minutes, then release any remaining pressure manually by lifting the whistle. Open the pressure cooker then proceed as for the saucepan instructions steps 6 - 9. **If you can't find smoked tofu, use regular tofu that has been pan-fried first. You may use a little liquid smoke and soy sauce to flavour the tofu while pan-frying. Replace the smoked tofu with cooked chickpeas. ****Pasta cooking time may vary depending on the pasta. See packet instructions, then divide the time indicated by half and in case of fractions, round off to the closest whole number down (not up). Example, if the package indicates 7 minutes cooking time, set the cooker for 3 minutes (i.e. 7/2=3.5, then round off to 3 minutes). If the package indicates 8 minutes, pressure cooker time would be 4 minutes. Pin this Smoked Tofu Mushroom Stroganoff recipe. And come pin along with us on Pinterest. Super delicious and creamy dish. A nice change in taste (and fragrance in the house) because of the smoked tofu :o) Recipe easy to follow with the electric pressure cooker that we used! Would add more vegetables next time…maybe some root vegetable.